2 Bedroom Spacious Apartment with Ocean Views, 2 Bathrooms Fully Furnished and Self Contained with most of the luxuries of home, a starter pack of Toiletries, Tea & Coffee, Linen and Bath Towels are Supplied, just bring Food and Beverages and Relax. Individually owned and decorated each apartment has its own unique decor. 2 Bedroom Spacious Apartment with Ocean Views, 2 Bathrooms Fully Furnished and Self Contained with most of the luxuries of home, a starter pack of Toiletries, Tea & Coffee, Linen and Bath Towels are Supplied, just bring Food & Beverages and Relax. Individually owned and decorated each apartment has its own unique decor. 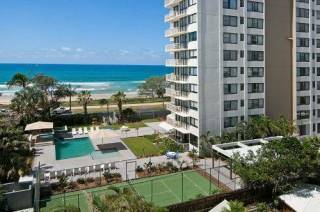 Newly renovated 3 bedroom apartments at our beachfront accommodation Surfers Paradise feature modern kitchens, two bathrooms, a comfortable lounge area with Cable TV, and a private balcony overlooking the beach. 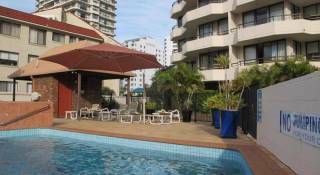 With an airconditioned lounge and ceiling fans in the bedrooms, this is the ideal apartment for your family holiday. These apartments are suitable for a maximum of 6 guests. Although not newly renovated, our generously sized 3 bedroom apartments are comfortable and spacious. Featuring a modern kitchen, two bathrooms, comfortable lounge area with Cable TV, and a private balcony overlooking the beach. Living areas and bedrooms feature ceiling fans, and some apartments are equipped with airconditioned lounges. Ideal for a relaxing family holiday! These apartments are suitable for a maximum of 6 guests. Enjoy a holiday to Remember, a Unique Absolute Beachfront Experience, walk straight onto the beach, marvel at the stunning BEACH & OCEAN VIEWS by day and SPARKLING LIGHTS at night, either from inside your SPACIOUS 2 or 3 bedroom apartment, your private balcony, by the Beachfront Heated Pool or up at our Rooftop Spa with Sundeck and BBQ area offering you 360 degree Views of the Gold Coast, where you can Relax all day if you wish. 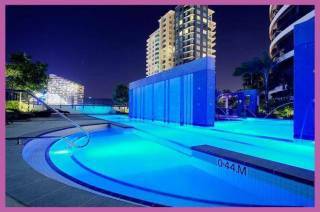 Beachfront Viscount is a Boutique building perfectly located in quiet no thru street, some great restaurants and clubs are just 100 metres away and the centre of SURFERS PARADISE or BROADBEACH are both just a 10 minute stroll. Transport is conveniently at the end of the street (about 100metres) if driving we provide FREE Undercover Parking. ~~Your choice of 2 or 3 Bedroom Spacious Apartments with 2 Bathrooms, much larger than just a Hotel Room. Individually owned and decorated each has its own unique decor, if there is a style you prefer please ask. Being Fully Furnished and Self Contained they come with most of the luxuries of home, a starter pack of Toiletries, Tea & Coffee, Linen and Bath Towels are Supplied, just bring Food & Beverages and Relax. There’s Lots To Do When Staying Here! Lay by the heated beachfront pool on a sun lounge or do the same on our Rooftop Sun Deck come indoors and bubble away in the Large Spa, when you are ready Cook up a feast for Breakfast, Lunch or Dinner on the Rooftop BBQ’s while taking in an awesome view of the Gold Coast. Then wear it off by Enjoying a Sunset or Sunrise Stroll along our uncrowded peaceful Beach. Terms & Conditions Cancel before 14 days from stay, lose full amount, cancel outside 14 days lose 1 night. If arriving out of office hours please notify at least 3 days prior so entry to Beachfront Viscount can be arranged. Cancel before 14 days from stay, lose full amount, cancel outside 14 days lose 1 night. If arriving out of office hours please notify at least 3 days prior so entry to Beachfront Viscount can be arranged.